Urim Books takes part in CBA International Convention 2018 held in Nashville, Tenn. in the United States on July 8-11, 2018. The International Christian Retail Show 2018, organized by Christian Booksellers Association (CBA), was held on July 8-11, 2018 at the Gaylord Opryland Resort & Convention Center in Nashville, Tenn. in the United States. New York-based Urim Books USA, an affiliated publisher of Seoul-based Urim Books, participated in the show and exhibited the books of bestselling Christian author Rev. Lee Jae-Rock. Lee is one of the most famous pastors according to ranker.com. Currently Rev. Lee serves as the senior pastor of 120,000-member-strong Manmin Central Church located in Seoul, South Korea. 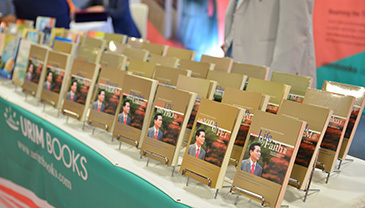 Some of the books showcased at the company booth included "My Life My Faith," which was on the list of the best sellers of Seoul-based Kyobo Book Center. The volume was translated into 40 different languages. According to the book "My Life, My Faith II," God let Dr. Jaerock Lee know about the relations of China and the U.S., the prosperity of China and Russia, the failure of the Sunshine Policy, and the opening of North Korea. The company also displayed bestselling books including "Heaven," "Hell," "Spirit Soul & Body," and "Awaken, Israel"
Curtis Riskey, president and CEO of CBA, stopped by the Urim booth and encouraged the company's book ministries in the U.S., Korea and around the world. Urim Books USA is a member company of CBA, and Urim Books Korea is an international member company of CBA. During the show, Urim agreed to bolster the collaboration with other companies including Ingram Content Group (Spring Arbor), Whitaker House (Anchor Distributors) in the US, Manna Christian Bookstores in New Zealand, 3.16 Europe in the Netherlands, and Alfa Omega in Romania.